The belt locks and the belts must be in their original position after folding back the seat cushions and backrests - they must be ready to use. Make sure that the transverse rod is inserted into the mounts C » Fig. 70 on page 74 or » Fig. 71 on page 75 in the forward position. Open the rear right door. Fold down the rear seat backrests slightly forwards, which makes it possible to clear the access for removing the net partition. Pull the net partition by tab A » Fig. 70 out of the housing B in the direction of mounts C .
Insert the transverse rod into one of the mounts C and push forwards. 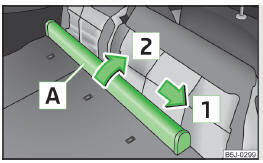 Insert the transverse rod into the mount C on the other side of the vehicle in the same way. Then push the seat backrest back into the upright position until the securing knob clicks into place - check by pulling on the seat backrest. Pull the transverse rod back slightly first on one side and then on the other and remove it from the mounts C » Fig. 70. Hold the transverse rod in such a way that the net partition can slowly roll up into the housing B without being damaged. If you wish to use the entire boot, the foldable boot cover can be removed » page 72. Fold the seat cushions and rear seat rests forward. Pull the net partition by tab A » Fig. 71 out of the housing B in the direction of mounts C .
Pull the transverse rod back slightly first on one side and then on the other and remove it from the mounts C » Fig. 71. Fold the rear seats back into their original position. Fold the seat cushions and rear seat backrests forward – first the left and then the right backrest. Push the net partition housing A » Fig. 72 in the direction of the arrow 1 and remove it from the mount on the right seat back in the direction of the arrow 2 . Insert the recesses on the net partition housing into the mounts on the rear seat backrests. Push the net partition housing in the opposite direction of the arrow 1 as far as the stop.